Matte pink graduation gowns are unique and will not be forgotten for years to come. Graduation season is upon us and here at Honors Graduation we have made it our goal to help graduating students to be prepared for their big day. We have all of your graduation wardgown needs as well as many other keepsakes and accessories to make certain that you are ready. Our matte pink graduation gown is a stunning way to represent yourself this graduation. Pink graduation gowns are most commonly worn by students graduating with their degree in music as well as public health. The soft salmon like pink along with the matte finish is a soothing option that goes exceptionally well with just about any of our graduation cord color combinations. We know you have been plugging away day in and day out to successfully reach this point. Graduation is a celebration, it is the time when your family gathers to show you how proud they are of you. I'm sure that over the years you managed to make some new friends and learn a few lessons. As you are surrounded by loved ones on this unforgettable occasion, you know now that no matter how difficult your dreams may seem, you are more than capable of accomplishing them. Here at Honors Graduation we offer various package deals to help your graduation shopping go as smoothly as possible. Our Cap & Robe + Tassel bundle includes your graduation gown along with the matching cap and a free tassel of your choice. We know this can be a rather stressful time so in addition to our package deals we also have our graduation attire available for separate purchase. Each of our graduation gown colors with the matte finish can also be found a shiny finish as well. Our gowns come in a large variety of sizes including multiple plus sizes ranging from 24-66. When you buy your graduation cap from Honors Graduation we will throw in a free tassel set. 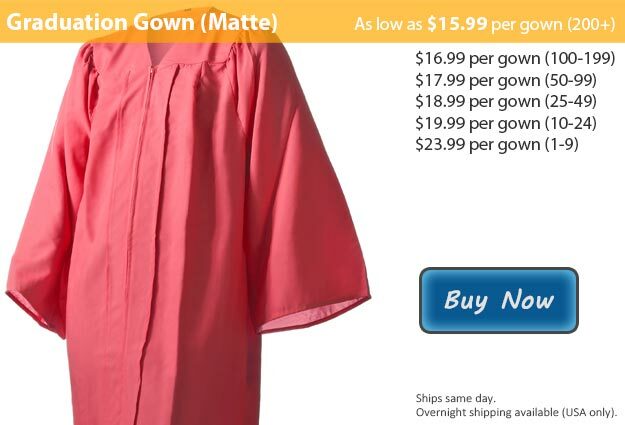 This graduation gown is also available in Pink Shiny Fabric.